View your resources on the go. Amazon Elastic Compute Cloud (EC2): Browse, filter, and search instances. View configuration details, CloudWatch metrics and alarms, and status checks. Perform instance lifecycle operations: start, stop, reboot, terminate. View block devices and create volume snapshots. Manage security group rules and Elastic IP Addresses. Elastic Load Balancing: Browse, filter, and search load balancers. View configuration details, attached instances, CloudWatch metrics and alarms, and health checks. Add or remove an instance from a load balancer. Amazon S3: Browse buckets, view bucket properties, and view object properties. View objects with a pre-signed URL using your device’s browser. Amazon Route 53: Browse hosted zones, view hosted zone details, browse record sets, and view record set details. Amazon Relational Database Service (RDS): Browse, filter, search, and reboot instances. View configuration details, CloudWatch metrics and alarms, and security and network settings. Auto Scaling: View group details, metrics, policies, and alarms. Edit min, max, and desired number of instances. 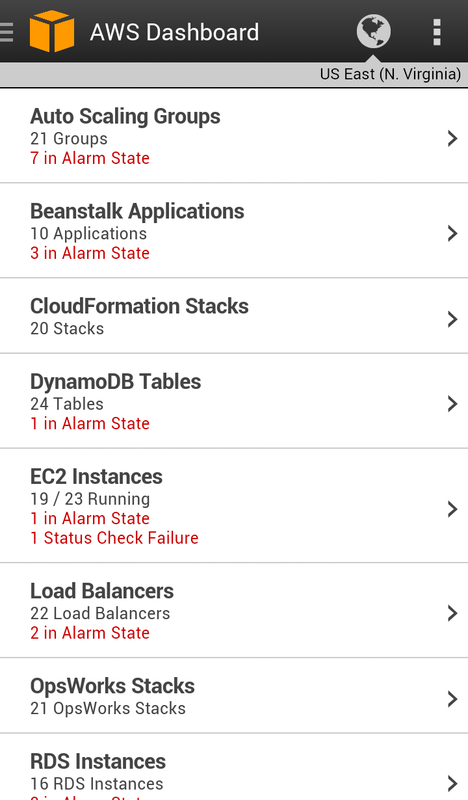 AWS Elastic Beanstalk: View applications and environments, view environment configuration, view events, deploy app versions, swap environment CNAMEs, and restart app servers. Amazon DynamoDB: View table and index details, table metrics and alarms, and modify throughputs. AWS CloudFormation: View stack status, overview, output, tags, parameters, events, and resources. AWS OpsWorks: View configuration details about your stacks, layers, instances, and applications. View instance logs, reboot instances, and get the status of deployments. CloudWatch: View CloudWatch graphs to gauge the health of your resources. List CloudWatch alarms by status and time, and see what automated actions are configured for each alarm setting. We regularly update the app with new features. Tell us what you need using the feedback link in the app’s menu. For security reasons, we recommend that you secure your device with a passcode and that you follow an AWS best practice by creating and using an IAM user’s credentials to log in to the app. If you lose your device, an IAM user can be deactivated to prevent unauthorized access. Root accounts cannot be deactivated.